Barbara Wysocka and Michał Zadara’s Chopin Without Piano, which was performed at Philadelphia’s Fringe Arts last week, begins like an ordinary orchestral concert. A conductor and a soloist bow in front of an orchestra; the soloist sits behind a grand piano, and the orchestra begins to play Chopin’s e minor piano concerto. But, as its title suggests, Chopin Without Piano takes a turn when the piano would enter. Instead of playing, the “pianist” begins to declaim the piano part, words replacing the piano’s voice. What follows is a wide-ranging reflection on Chopin’s life, legacy, and place in official Polish culture–as well as, of course, consideration of the concertos themselves. The text, by Wysocka (who performs it as the “pianist”) and Zadara (who directed) is assembled from Chopin’s letters, writings about Chopin, writings from Chopin’s day, and more contemporary work. Chopin Without Piano: Philadelphia Fringe Arts, October 30, 2015. 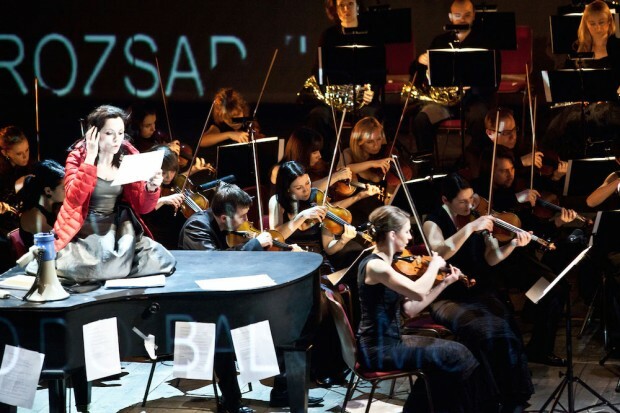 Produced by CENTRALA, Text by Barbara Wysocka and Michał Zadara, performed by Barbara Wysocka, conducted by Bassem Akiki with the Chamber Orchestra of Philadelphia, directed by Michał Zadara. This production’s American tour was organized by Barbara Milewski and Allen Kuharski from Swarthmore College, where it premiered before a short run in Philly. It will be in Boston at Arts Emerson next week. Full disclosure: Barbara (M.) was my colleague when I taught at Swarthmore last year and I studied with both her and Allen when I was an undergraduate. The text alone (in Polish with Milewski’s English surtitles) is striking. It rehabilitates Chopin as a musical radical (calling this his “piano radicalism”), condemning his domestication. Exhibit A is the strange sonata form of the first concerto. Why do we [musicologists] often assume Chopin’s dismissals of convention reflect incompetence? (A 1835 London review of this concerto called it “a heterogeneous mass, compounded of filthy sounds.”) In Polish culture, in contrast, Chopin has become a hackneyed national symbol. I think the narrative of Chopin as a nationalist rube appeal to our love of folksy authenticity and, as Chopin Without Piano states repeatedly, give us a pass from confronting the weirdness of this music by classifying it as peripheral and naive. And as the piece unfolds its scope expands. The second movement of the E minor is devoted to Chopin’s illness in London, with texts from letters. The third movement, the “Rondo à la Krakowiak,” is devoted to Chopin as Pole: the rondo’s refrain is comprised of insipid quotations from a Chopin memorial, describing his music as “a vision of the national Polish soul… it strides into the future, into the bright glow of perfection.” Chopin, a counter-text argues during one of the rondo episodes, “is not the music of the beautiful Polish countryside but the music of a permanent break with Poland… he will always be a stranger to himself and to the world.” The movement ends with a powerful denunciation of “traditional sentimental Polish anti-intellectualism” which “has turned Chopin into a provincial bard,” a conservatism that denies refugees, social justice, and gay marriage. After a pause, we continue to the f minor. Again, we begin with musical descriptions of the absent piano, but this time we move into the world of the performer with words from pianists describing their own experiences of playing the movement as it unfolds without their instrument, which is continued in the second movement. Finally, the third movement returns to the political, with a megaphone employed to read General Wojciech Jaruzelski’s proclamation of martial law from 1981, an announcement accompanied by Chopin on loop. A few weeks ago I watched a few videos from the Chopin Competition, where one also hears Chopin on loop. Each twenty-something pianist went through a concerto–usually the e minor, as Chopin Without Piano reminds us, no one ever wins the Chopin with the f minor–like an an obstacle course, their performance on every note to be scrutinized and compared to their colleagues. It’s a strangely soulless endeavor. Chopin is simultaneously incidental–a series of hoops that could easily be a different series of hoops–and a monument–repeated over and over in a sort of ritual. Removing the piano from Chopin: is there still a point? At times the biggest presence in Chopin Without Piano, as suggested in its title, is the absence of the protagonist. At times you can imagine its voice, but the text forces you to confront that loss. Chopin’s piano concertos can be reassembled, but now it will be Wysock’s voice haunting their scores. *This was particularly poignant to me because the silent instrument was the Bösendorfer with which I played a great deal of chamber music in college.